Since Saturday, Sept. 3 when Nebraska kicked off its regular season against Fresno State, several opponents went above and beyond to honor punter Sam Foltz. After tragically losing Foltz at the end of July, the 2016 season has been one in his honor. By participating, Nebraska's opponents have shown that some things are simply bigger than football. Fresno State kicked off the season for Nebraska by wearing helmet stickers for Foltz. It was a kind gesture to get an emotional season started. Additionally, Fresno State declined a delay of game penalty when Nebraska only sent 10 men onto the field for the first punt. Nothing will explain the moment that Oregon placed flowers at the 27-yard line for Nebraska. It was incredibly special to witness. Similar to Fresno State, Northwestern also honored Foltz with helmet stickers. #SF27 looks good on any helmet, for what it's worth. The Fighting Illini kicked off the presentation of jerseys in Foltz's honor. They even signed the jersey, which was really neat. Following in Illinois' footsteps, the Boilermakers presented a custom No. 27 Purdue jersey with Foltz's name on the back. The Wisconsin matchup was an emotional one as the Badgers' kicker Rafael Gaglianone joined the Huskers in taking the field. He had previously switched his number to No. 27 in honor of his friend, which made it even more special. Ohio State went all out in honoring Foltz. From start to finish, Foltz was extremely present at Ohio Stadium. 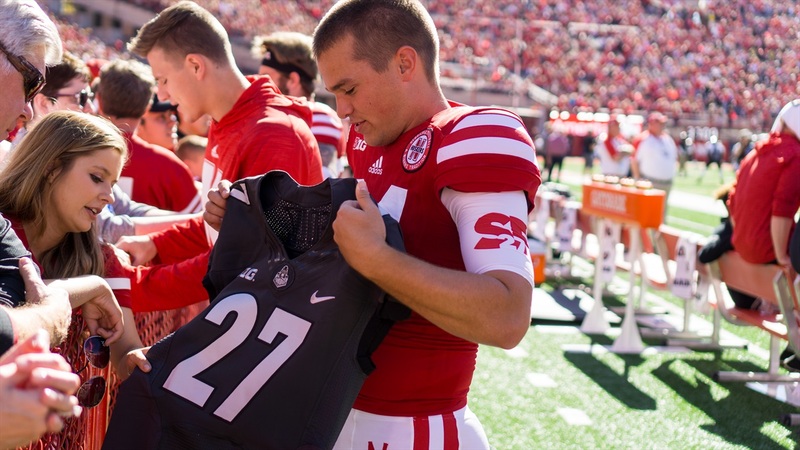 Minnesota offered a jersey to Nebraska in Foltz's honor, as well as flowers. Additionally, the team spoke about what Foltz meant to them. Much like many for, the Terrapins created a custom Foltz jersey and presented it to the Husker specialists. Iowa not only presented Foltz with his own Hawkeye jersey, but also his own locker at Kinnick Stadium. Beyond that, there was Nebraska's senior day tribute, the Big Ten commemorative coin, BTN The Journey's special and College GameDay's segment. After losing Foltz, everything done in his honor was an incredible act of kindness. Whether it was a win or a loss, these are the moments that will never be forgotten.